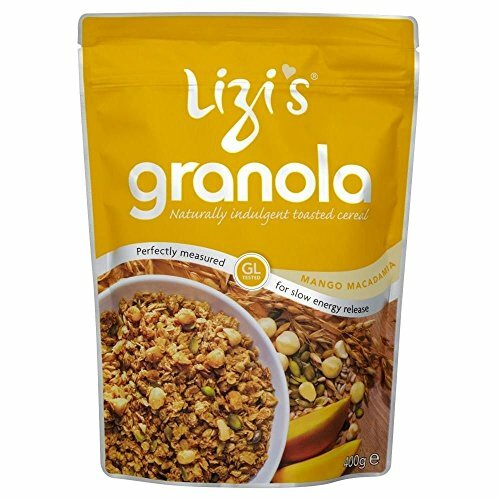 This granola is baked in a rich mango puree with added mango pieces and macadamia nuts to bring you a taste of the tropics. Macadamia nuts are truly delicious and contain the highest quantity of beneficial mono-unsaturated fat of any nut. Serve with yoghurt or milk and add your own fresh fruit for a sustaining high fibre breakfast. Or sprinkle on your evening fruit dessert or ice cream as a crunchy topping.IngredientsJumbo Rolled Oats Rapeseed Oil Oligofructose* Desiccated Coconut Fructose Macadamia Pieces (5%) Mango Puree (4%) Concentrated Apple Juice Black Treacle Pumpkin Seeds Golden Linseeds Sunflower Seeds Dried Mango Pieces (1%) Natural Flavour. *Oligofructose is a natural soluble fibre derived from chicory. As a prebiotic it helps maintain a healthy digestive system.Allergy AdviceContains tree nuts. Dairy free wheat free**. Suitable for vegetarians and vegans. No hydrogenated oils. No GMOs. Made in a factory which handles peanuts and sesame seeds. **For coeliacs: natural field oats may contain traces of wheat. We cannot guarantee that this product is gluten free.